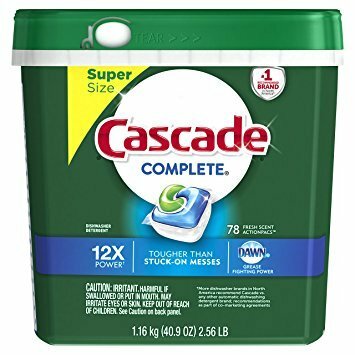 Cascade Complete ActionPacs power away stuck-on messes, which means you can skip the prewash and still get a complete clean. That's because every Pac is formulated with the grease-fighting power of Dawn. Trust your dishes to Cascade Complete ActionPacs dishwasher detergent - your new shortcut in the kitchen. If you have any questions about this product by Cascade E, contact us by completing and submitting the form below. If you are looking for a specif part number, please include it with your message.